A few readers commented that they were impressed by the decor of our room on the Marina. They weren't expecting it to look so nice. If you thought that was impressive, wait until you see the public areas and restaurants. Oceania Cruises bills themself as mid-luxury but after to speaking with the designers, it was clear that no expensive was spared on the interior design. It was most intersting to find out how many rules and regulations they had to follow for the materials and fabrics used through out the ship. The biggest threat on board is a fire so many precautions are taking to both prevent and contain one. If it was something that could be thrown overboard, it could be wood. If not, it had to meet certain standards for flame retardency. The designers were given the instructions from the shipyard in Italy who knew what could be used and where. It was really quite fascinating and made you realize how much work went into Marina. It is also surprising that they chose to use regular fabric from Kravet and Lee Jofa in many areas and not commercial grade fabric. Talk about luxury! 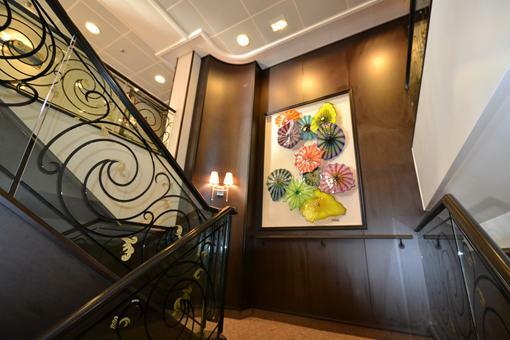 The Grand Staircase welcomes you on board and had glass medallions by Lalique. Art filled the ship including these glass pieces. Mary Hart also greets you in the lobby since she is the godmother of the Marina. We didn't shop but could have at Chopard and Ralph Lauren among other boutiques. The Library was one of our favorite spaces. It looked perfect for hiding out in wet weather. You could borrow any of the book for the duration of the cruise too. Cushions upholstered in Kravet fabric #27968 - 12. Chairs upholstered in Kravet fabric #29568 - 5. Chic sofa in the piano bar upholstered in Barbara Barry fabric for Kravet. Joan Miro artwork lined the entrance to the Casino. The Casino looked a bit like a chic spaceship in Silver and purple. The Casino bar also glowed. I loved the tufted banquettes. I wish I had taken a better photo of this antique ship that was over 130 years old. Dakota Jackson had a special glass enclosure made for it in Germany and it was so heavy, it had to be bolted into the floor. 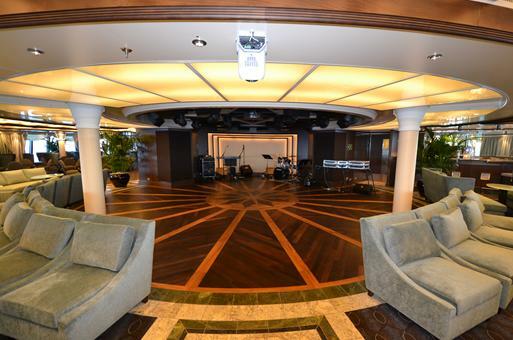 The center of the dance floor in Horizons. Horizons is where we danced the night away! Surprised they didn't use commercial grade fabric on these chairs but instead they are from Kravet #23956 - 3. 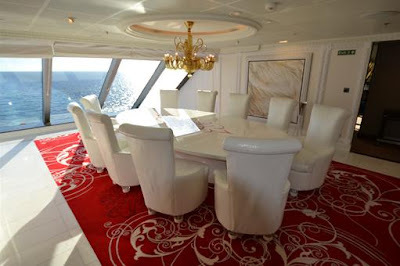 The Grand Dining Room harkened back to cruises of yesterday. 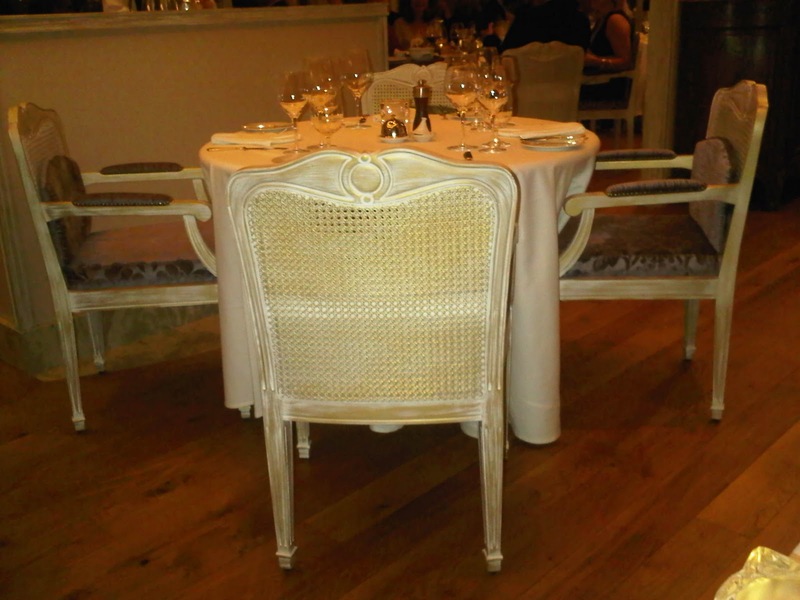 The chairs in the Grand Dining Room were upholstered in Kravet fabric #24154 - 4. Toscano was the Italian restaurant where we ate the first night as we were pulling out of Miami. 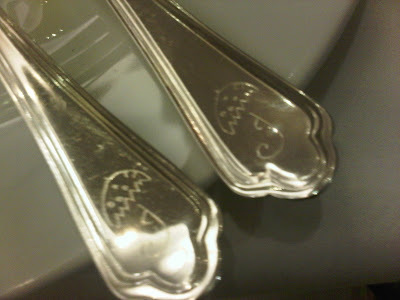 Since the ship was built in Italy, there were also many Italians on board and at Toscano that night. 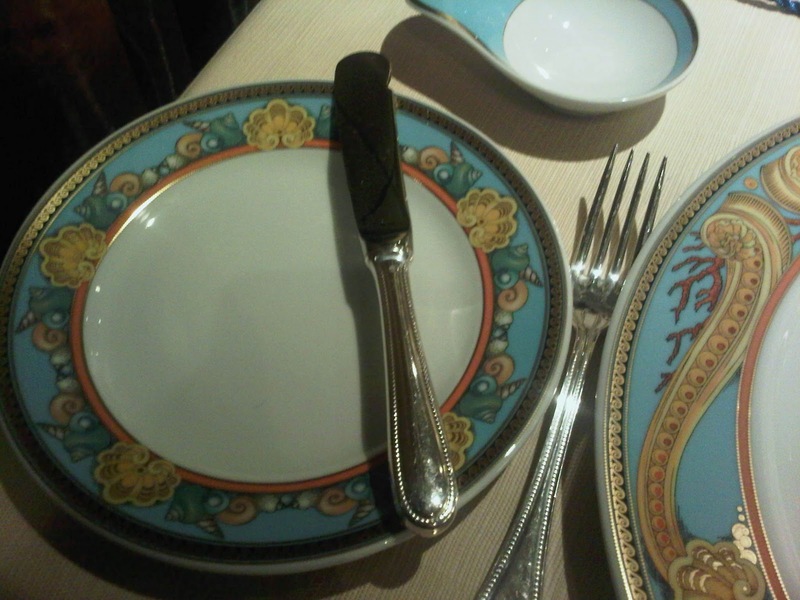 Excuse the bad BlackBerry photo but I had to get a picture of the Versace china and Chritofle flatware. 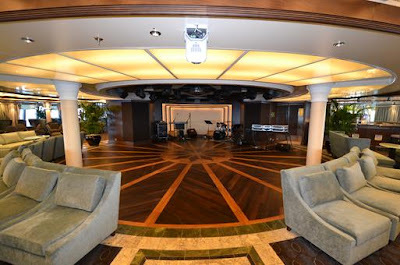 We didn't eat at the steakhouse on board but were able to tour the space. Jacques Pepin had his own French restaurant on board the Marina. 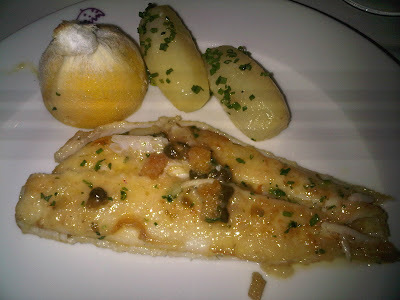 I am mad that I didn't bring my camera to dinner that night to shoot Jacques cooking for us in the kitchen! I did have my BlackBerry to record eveything I was served that night. It looked just as good as it tasted! 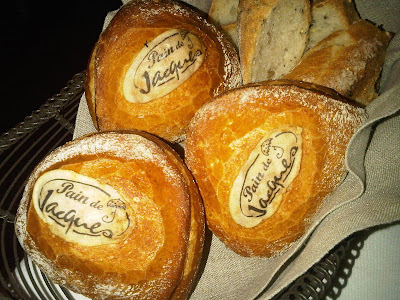 I loved the Pain de Jacques! 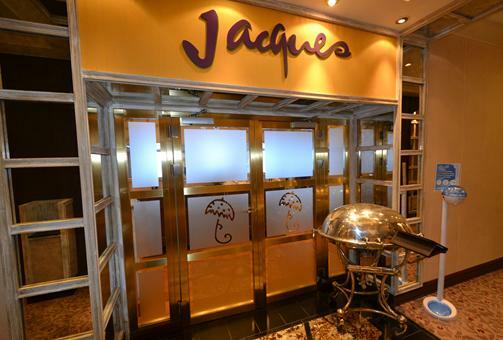 I also loved the Jacques logo of the J and an umbrella top or parapluie in French. The goat cheese salad at Jacques. I didn't have the pumpkin soup but couldn't resist taking a photo of it. 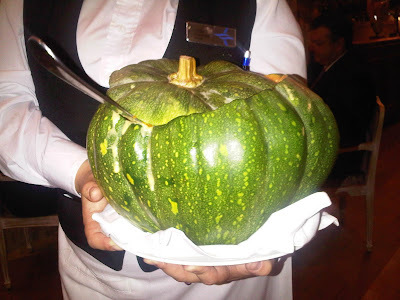 Stefan and I were wondering where the Marina finds green pumpkins in February! After watching Downton Abbey, it would be fun to see what goes on behind the scenes and on the staff floors. Maybe we can do that on the next cruise! The Dover sole at Jacques. 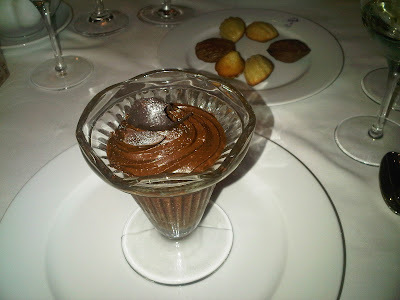 Mousse au chocolate at Jacques. 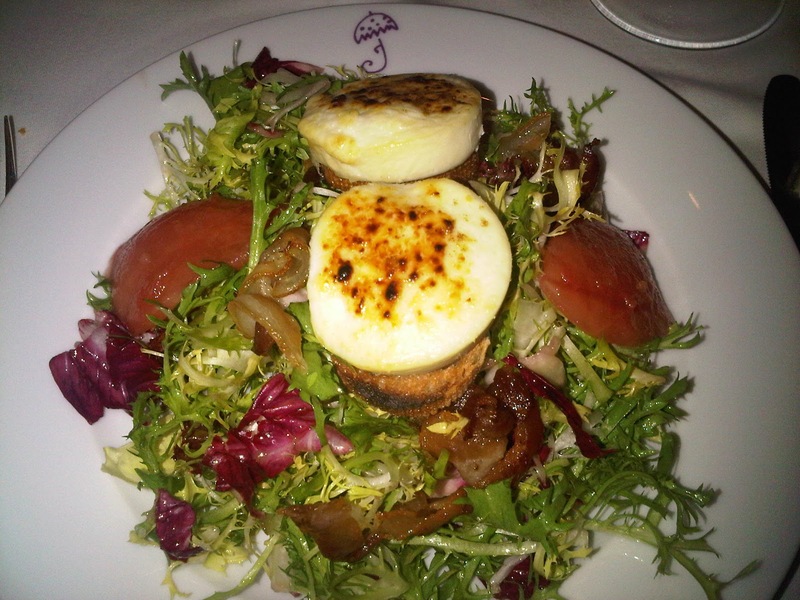 We didn't eat at Privée but it looks like a great space for a private dinner or meeting. Red Ginger was the Asian restaurant on board Marina. 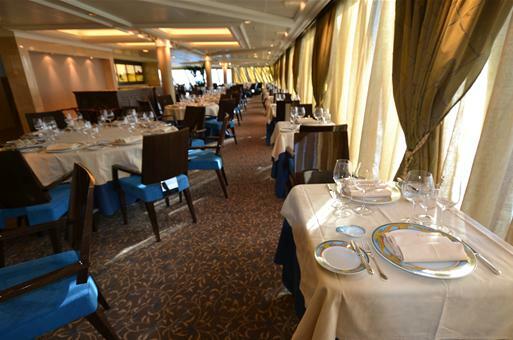 I have to say that the food in every restaurant was amazing but Red Ginger was a hit with everyone on board. They had the most delicious selection of teas to compliment the Asian flavors of the dishes. As with any cruise, Stefan and I ate a lot but we were also active and walked a lot in Nassau so we luckily didn't gain any weight. There is also a gym on board to work off all the delicious calories if you're worried! As I mentioned before, I never thought I would take a cruise and I'm so glad my first experience was a delightful experience. So much so, that I'm already thinking about where I can go next!